KIEV, Ukraine -- Ukraine has captured three Russian military intelligence officers and estimates there are at least 100 more Russian military personnel directing unrest in eastern Ukraine, says Valentyn Nalyvaichenko, director of Ukraine's national security service. "We detained three GRU officers," Nalyvaichenko said Tuesday, referring to the Russian Main Intelligence Directorate by its Russian acronym. "They are being interviewed in Kiev and have given us very important information and evidence." Ukraine has arrested 21 Russian officials involved with what he called groups of criminals that have taken government buildings and terrorized the citizenry in cities such as Donetsk, Slovyansk and Kharkiv, Nalyvaichenko said, speaking from an office in Kiev in a YouTube appearance for invited reporters that was arranged by the Atlantic Council, a Washington think tank. Russia denies that its military is in eastern Ukraine, but has admitted that its soldiers were in Crimea helping pro-Russian militants take over the province. Nalyvaichenko spoke as various media reported that a Ukrainian military aircraft was fired upon in eastern Ukraine, and that U.S. journalist Simon Ostrovsky had been detained together with a Ukrainian prosecutor in Donetsk. The incidents are evidence that "the escalations in eastern Ukraine continue to rise," he said. Nalyvaichenko painted a picture of a long-planned Russian operation in his country that includes elements of the regular military, intelligence services, groups of criminals and unemployed Ukrainian citizens recruited from areas of high unemployment who are being paid to take part. The current campaign is the result of a two-year Russian effort to create "very specialized networks" of Russians and Ukrainians "and what is happening today is a deployment of those networks," he said. "Behind them are GRU and Russian officers serving as provocateurs." "We know for sure that up to 30 special GRU and other military officers are operating in Slovyansk and Donetsk," he said. "They are operating with criminals that are being guided by those Russian officers." The identities of two main organizers have been shared with international authorities so they can be detained if they appear in those countries, he said. Russia has massed 40,000 troops, 700 armored personnel carriers and 250 aircraft near Donetsk, Kharkiv and Ukraine's southern border, in addition to the thousands of troops stationed in Crimea, which Russia annexed last month. Russia has put those forces on constant maneuvers, deploying and undeploying, initiating provocations at the border and causing Ukraine's military to be on night-and-day alert several times during the past month and a half, he said. "It looks like terrorism from the neighbor country to a smaller country, day and night using all possible military tools and methods," he said. "This is simply not acceptable (and) someone should stop that." 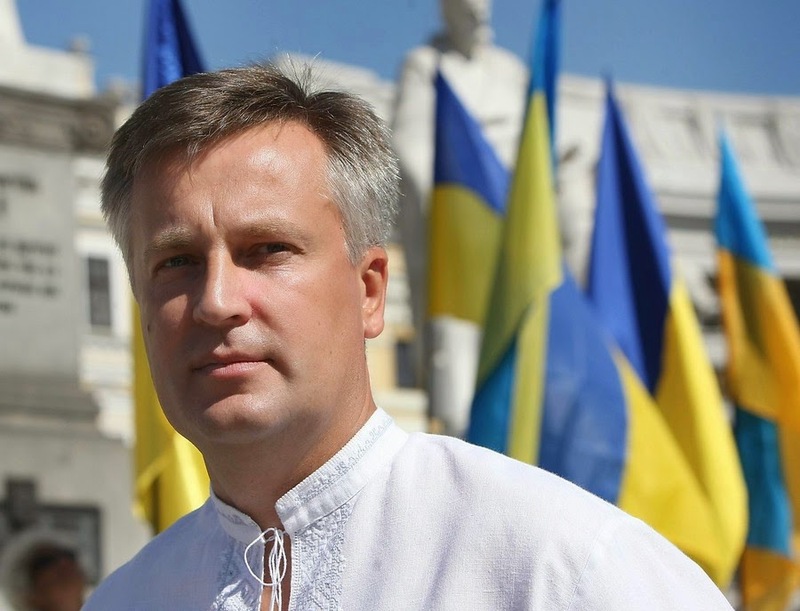 Nalyvaichenko said Ukraine is relying on a monitoring mission by the Organization for Security and Cooperation in Europe and close cooperation with the Russian government to reduce tensions, but that all sides need to call for peace, as agreed to last week in Geneva by representatives of Ukraine, the European Union, the USA and Russia. While Ukraine, the EU and the USA have all "called for everybody to refrain from violence," however, "there's been no single statement from Russia to the militants to vacate buildings and no orders to the military people to stop," he said.